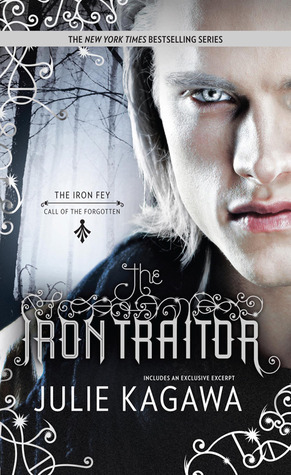 At first I thought I'll get disappointed with this book but to tell you the truth if I liked The Iron Fey: Call of the Forgotten #1 entitled The Lost Prince, I liked this one better, oh wait! I meant I love this! This second book is more exciting and the adventures are more astonishing. More fighting scenes, and more heartbreaking moments. This book is more beguiling. The cover speaks for the whole book, so is the title. It is really, really cool! From the beginning to end it is captivating and poignant in a good way, it will attract you to read more and discover. The story is fun to read and you will react on those scenes that involves Keirran and Ethan. You will also learn here how important family was yet you'll discover something more. Trust is a powerful tool but you'll have to be careful. Friendships has limits too, they can betray you or stay beside you. Ethan Chase got involved to another quest that involves the Fae world. Annwyl visited Ethan Chase in his house when Kenzie decided to come visit, Annwyl said that everyone is looking for Keirran. At the end of the day Ethan Chase decided to help Annwyl find Keirran. However when they are in search so many things happened and trouble are on their way. Fate is not being friendly to them and their adventure was about to save Annwyl, although she's with them the truth is something's bothering her, she only want to see Keirran for the last time and yet the prince refused to, he's trying all the alternatives to spare the life of the girl he wants. So with the help of the two mortals (Ethan & Kenzie) they started the other part of the quest until Ethan found out about the premonition. There's so many things I want to tell, I might end up revealing the whole story so I'll stop now. This book is really interesting and that secret about the 'premonition' bothers me on the first book and this next book answered it. Things are really exciting here all the questions you have on the first book, the answer will be here. It gave me goosebumps! for real, I didn't expect that and the ending is soooooooo unexpected!!! It was like my heart stops for a second because it's appalling, though I already know but I still can't believe it will really happen, and now I am yearning for the next book, I would not except that thing to happen. I can't waaaaiiittt, when will it be out? someone answer me? (kidding). Did I mention I love the cover? if I did, I'm saying it again coz it is really alluring! And, this is really a great book, fun and exciting to read!